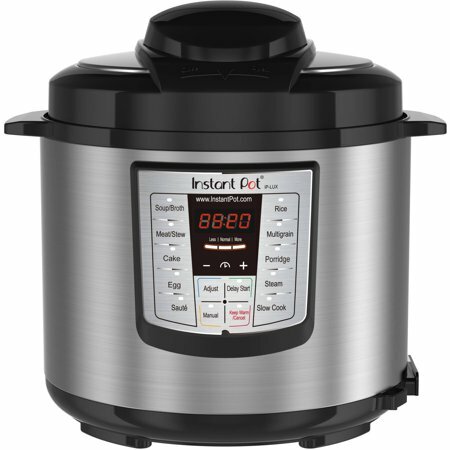 The all-new Instant Pot IP-LUX60 Version 3 is a 6-Quart Multi-Functional Stainless Steel Cooker that can speed up your cooking, making it two to six times faster than standard cooking. No more rattles and hisses, no more adjusting the heat, Instant Pot Lux V3 does it for you. The new design of the electric pressure cooker makes it more energy efficient than other cookers, using up to 70 percent less electricity each time it is plugged in. The Instant Pot pressure cooker is a versatile tool that offers a variety of cooking options within one single container. Use the pot as a rice cooker, steamer, slow cooker, saute, warmer or pressure cooker, now also features a cake cooking and egg cooking function simply by adjusting the settings. Instant Pot LUX60 V3 6 Qt 6-in-1 Multi-Use Programmable Pressure Cooker, Slow Cooker, Rice Cooker, Saute, Steamer, and Warmer The all-new Instant Pot IP-LUX60 Version 3 is a 6-Quart Multi-Functional Stainless Steel Cooker that can speed up your cooking, making it two to six times faster than standard cooking. No more rattles and hisses, no more adjusting the heat, Instant Pot Lux V3 does it for you. The new design of the electric pressure cooker makes it more energy efficient than other cookers, using up to 70 percent less electricity each time it is plugged in. The Instant Pot pressure cooker is a versatile tool that offers a variety of cooking options within one single container. Use the pot as a rice cooker, steamer, slow cooker, saute, warmer or pressure cooker, now also features a cake cooking and egg cooking function simply by adjusting the settings. Love it, has made cooking fun again. If you are hesitating don't. Just go to facebook group "Instant Pot Community" and you will be convinced. What a wonderful and generous company! I recently bought an Instant Pot for our home, and it's been great! The first thing I noticed was how this has provided an opportunity to eat together as a family and have wonderfully delicious meals as well. By using the fabulous Instant Pot pressure cooker, meal prep time and cook time has been drastically reduced, the kids even like to watch us put it all in one pot to cook. This allows us and our busy schedules time to spend with one another. I am AMAZED at how good the food tastes, how tender the meat is, etc. We've own a microwave for decades, and while it speeds things up you suffer with quality. Now this gives us the best of both worlds, and we are trying many new recipes too! I was part of something at work where we were encouraging people to eat together again, and I wrote to Instant Pot and asked them if they would be willing to donate one to the non-profit Head Start agency I work for, and they graciously agreed! This week we were able to award a three generation Head Start family with this amazing cooking appliance...and a tool that will help keep their family eating together. Thanks for the awesome invention and kind hearts! You don't want to purchase any brand other than an IP! Best company that stands behind their product & great customer service with courteous and friendly staffers! Love my IP & love this company! 5 star out of 5!!! I use this instant pot more than any other appliance in my kitchen. I have one at our summer home and winter home. It saves a lot of time, but, I also like that I can put something on to cook and leave it. After cooking, it keeps contents on warm. Used it everyday since I got it. The recipes for the Instant pot from Amy &Jackie are an incredible adjunct to this wonderful product. Everyone with a time /life imbalance should get one. I love my instant pot. Hassle free way to cook rice, beans and soups. I have both sizes and use them daily. Great cusuomer service and generous return policy!! Super happy with my Instant Pot! I love this pot. Using it for cooking rice, bulgur and quinoa, for making soups and stews, making porridge in the morning and even cooking my hard-boiled eggs to perfection! My most favorite new kitchen device!!!! It's worked great. I've enjoyed everything I've made so far. 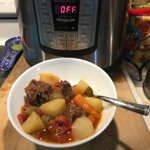 There are plently of recipies specific to Instant Pot online to keep me eating well for a long time! Multiple things can be cooked in asingle go. The delay timier is my favorite, I have food ready by the time I reach home in the evening and not keeping the kids wait. I really like instant pot. It could be warmer when it's in its slow cooking mode. That is the only reason why I gave it 4 stars I also had to call the tech for help, but other than that it's awesome and hearty and strong. Don't be fooled with knock offs of the instant pot. She's a beauty and makes all kinds of stuff. I didn't see a need for canning so I passed on that for this model. The steel pot is amazing. It's strong and sturdy as well as the rest of the set up. I did notice the timer was a little bit to figure out because it doesn't show the : before it hits the 60 minute mark. So that was a little disheartening. But I adapted and I'm ok with it now. When you do the cook test for the first time. Use 3 cups of water and not the little plastic they send you, that is for measuring rice. Now the drop float indicator is kinda disappointing. I mean it works just fine, but because of the model it was it didn't have the same set up than what you see in the videos and any image online. They need to update that. I did get reassurance from the company that it is indeed correct for the model. It's kinda like common sense to use it, but I think too much and that makes me wonder somewhat at times. And the best part is NO buyers remorse. Isn't that always the best part?